Nice ceramic cookie jar for your holiday treats. Made of hand painted ceramic. 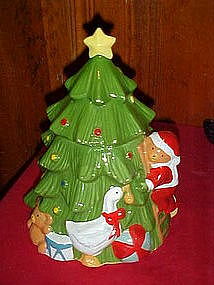 A bear dressed in a Santa suit decorates a Christmas tree with the help of his goose friend. Presents and toys sit under the tree. No makers mark or sticker, but appears to be a newer jar. No cracks or chips. It looks as if a tip on the star had a glaze chip but has been touched up nicely. Measures 11" tall.